The Phillies targeted a select group of relievers in potential deals for Shane Victorino, ultimately deciding on Dodgers righty Josh Lindblom in Tuesday’s trade. Lindblom is 25 years old, under team control until 2017, and features a decent fastball-slider combination with a heater in the 91-94 mph range. He is also an example of why splits are important in properly evaluating players. In his brief career, Lindblom has thrown 77.1 innings with pretty decent numbers. He has a career 2.91 ERA, 23% strikeout rate and 9% walk rate. He has surrendered just over one home run per nine innings. He has stranded runners at a well above-average 85.1% clip (league average is approximately 73%), and has held the opposition to a .270 BABIP. On paper, there is a lot to like about this young reliever. But his overall numbers are misleading. He has logged over half of his innings in the friendly confines of Dodger Stadium, and sports a pretty drastic performance split. The Phillies probably pursued Lindblom because of his contractual status, his makeup, and his results to date, but they aren’t likely to garner the benefit of his home performance at Dodger Stadium. And quite frankly, the road version of Lindblom is a poor relief pitcher right now. 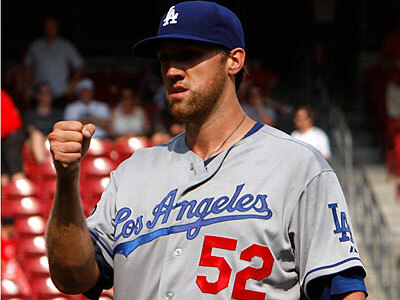 Lindblom has thrown 40 innings at Dodger Stadium and 37.1 innings on the road in his career. At home, he has a 1.35 ERA, 3.0 K/BB ratio, 95.8% strand rate, 0.68 HR/9 and 3.29 FIP. The home version of Lindblom over the last two seasons is a very good reliever. The road version? Not so much. Over 37.1 innings away from Dodger Stadium, Lindblom has the following numbers: 4.58 ERA, 2.1 K/BB ratio, 73.9% strand rate, 1.45 HR/9, 4.80 FIP. No extensive breakdown of those numbers is needed. They speak for themselves. Now, 77.1 innings is far too small of a sample size from which to draw definitive conclusions. Lindblom is still young and relievers are a very fickle breed to begin with. He could pitch lights out while with the Phillies and spit in the face of his early-career home/road splits. But more likely than not, Lindblom won’t pitch as well with the Phillies as he did with the Dodgers. This isn’t to say that he will automatically come in and mirror his career road numbers. A common analytic mistake is to assume that, once a pitcher leaves a friendlier home park, his numbers will immediately and substantially worsen. Instead, it’s increasingly likely that Lindblom’s numbers regress without plummeting. He won’t be as solid as he was in Los Angeles but he also won’t suddenly start pitching like the bad version of Jose Mesa. The road numbers are a red flag, but so is his groundball rate. Citizens Bank Park has played fairly neutral in overall runs scored in recent years, but it still profiles as a home run park. Perhaps Rich Dubee will harness Lindblom’s raw ability and turn him into a better overall pitcher. Maybe Lindblom will learn a new pitch. True talent is a moving target, after all. But, right now, all we know is that Lindblom’s overall career numbers belie a vastly better pitcher than the Phillies will likely see when Charlie Manuel raises his right hand to signal him into the game.